Hot Asphalt – Be Aware!!! As the summer heats up, and you walk your dog or other pet, be aware that while the sidewalks and roads feel hot through the bottoms of our shoes, realize our beloved fur babies don’t have protection on their paws. 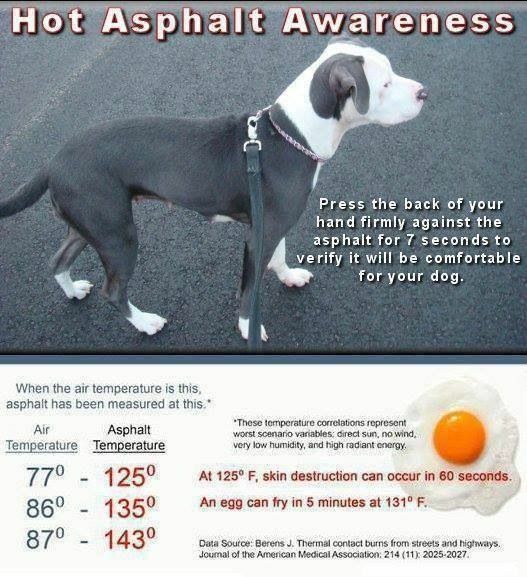 Author foguthPosted on May 27, 2018 Categories dogs, petsTags #petsafety, pets15 Comments on Hot Asphalt – Be Aware!! !